One month ago, I shared a postcard of the otherworldly cave homes in Guadix, Spain. Here's another postcard that looks more than Bizarro World than the Earth we know. ON HIGHWAY U.S. 30, WYOMING. AMES MONUMENT IN THE BACKGROUNDAmes Monument commemorates the Ames Brothers, whose financial backing enabled the Union Pacific to first span America with a railroad. Sherman Hill is the highest point between the Coasts for both railroad and highway. "The Ames Monument is located about 20 miles (32 km) east of Laramie, Wyoming, on a wind-blown, treeless summit south of Interstate 80 at the Vedauwoo exit. 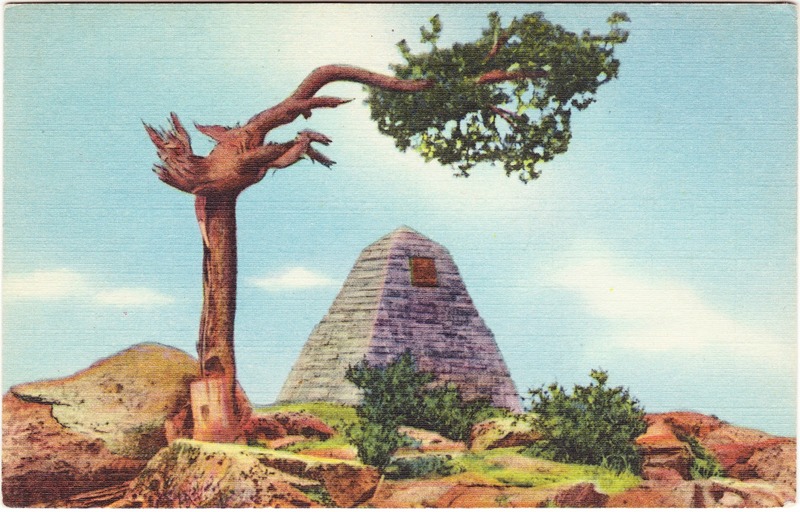 The monument is a four-sided, random ashlar pyramid, 60 feet (18 m) square at the base and 60 feet (18 m) high, constructed of light-colored native granite. The pyramid features an interior passage, now sealed, alongside the perimeter of the structure's base." Sealed interior passage, huh? So maybe it is a pylon, with a secret matrix table inside. If you ever happen upon it, a word of warning: don't put two green crystals together.